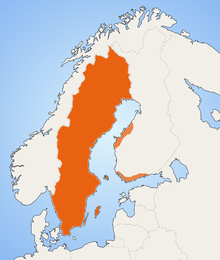 Swedish (svenska [²svɛnːska] ( listen)) is a North Germanic language spoken natively by 10 million people, predominantly in Sweden (as the sole official language), and in parts of Finland, where it has equal legal standing with Finnish. It is largely mutually intelligible with Norwegian and to some extent with Danish, although the degree of mutual intelligibility is largely dependent on the dialect and accent of the speaker. Both Norwegian and Danish are generally easier for Swedish speakers to read than to listen to because of difference in accent and tone when speaking. 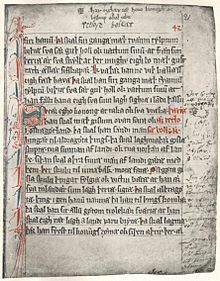 Swedish is a descendant of Old Norse, the common language of the Germanic peoples living in Scandinavia during the Viking Era. It has the most speakers of the North Germanic languages. Haugen, Einar (2009). "Danish, Norwegian and Swedish". In Bernard Comrie. The World's Major Languages. New York: Routledge. pp. 125–144. ISBN 978-0-415-35339-7. 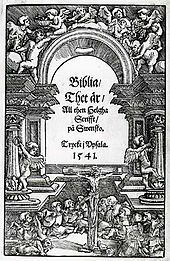 For a list of words relating to Swedish language, see the Swedish language category of words in Wiktionary, the free dictionary. Wikivoyage has a phrasebook for Swedish. Wikisource has the text of a 1905 New International Encyclopedia article about Swedish language. This page was last edited on 16 April 2019, at 15:00 (UTC).